FILE - Children living in a cocoa-producing village walk back from the fields carrying wood and food stuffs on their heads on the outskirts of the town of Oume, Ivory Coast, June 30, 2005. FILE - Farmers break cocoa pods in Ghana's eastern cocoa town of Akim Akooko, Sept. 6, 2012. 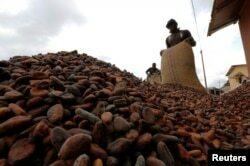 Yet the economies of Ghana and Ivory Coast, which together account for more than 60 percent of the world's cocoa supply, have been hit hard by a sharp drop in world prices that have seen cocoa futures plummet by around a third since last summer. "If these low prices translate into lower incomes for poor families, and household poverty gets worse, we are worried that the risk of child labor will increase," Nick Weatherill, executive director of ICI, told Reuters. Children could be taken out of school if their families can no longer pay the costs, and many may be made to work on cocoa farms if growers cannot afford to employ laborers, he added. "The drop in prices does create greater vulnerability ... [due to] further demand in an already strained landscape," Ruth Dearnley, chief executive officer of Stop The Traffik, said as charities and activists marked World Day Against Child Labor. FILE - Men pour out cocoa beans to dry in Niable, at the border between Ivory Coast and Ghana. Since reports of child labor on cocoa farms in Ivory Coast emerged in the late 1990s, the chocolate industry has been under pressure to prove its beans are not cultivated by children. 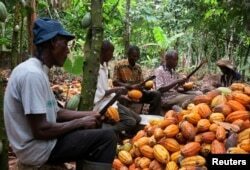 The ICI said its child labor monitoring and remediation system (CLMRS), which it has established in the supply chains of cocoa giants Cargill and Nestle, expanded last year to cover about 60,000 cocoa farming households in Ghana and Ivory Coast. A report earlier this year by Stop the Traffik which analyzed the sustainability efforts of some of the world's leading chocolate companies found that Nestle had the best CLMRS and was the most transparent at reporting cases of child labor. "Whilst the drop in cocoa prices could potentially undermine civil society efforts to date ... the reality is that these efforts are more critical than ever," Dearnley added.